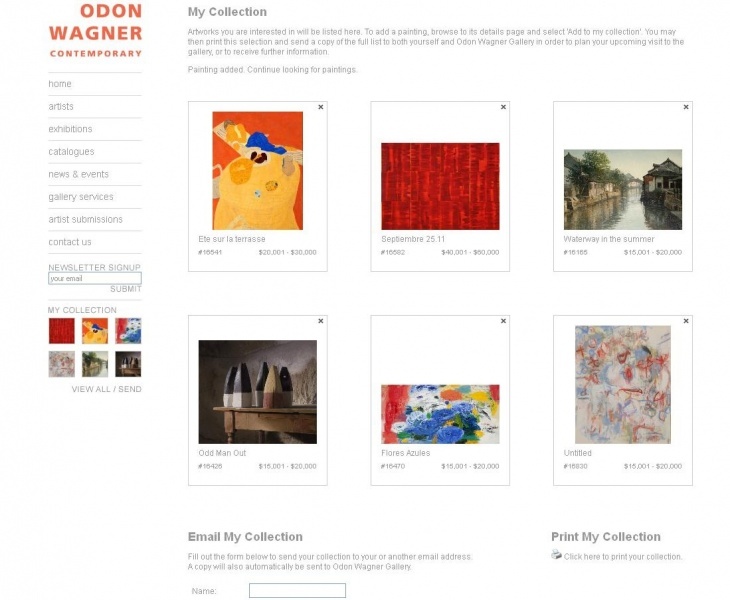 Odon Wagner Gallery is proud to introduce a new website feature: My Collection. My Collection is designed to allow you to select your favourite works of art from our gallery. Once selected you can save them, print them and email them. To locate this feature choose an artist and click on an artwork. On the right hand side click:+ add to my collection. To view all the works you have collected please click View All/ Send on the bottom left hand side of the screen. There you can see your entire selection and edit it. You can Email My Collection to yourself, another email address, or to us if you have price inquiries or would like to make an appointment with us to view the works in person. Lastly, you can Print My Collection to print a copy. You can collect from Odon Wagner Gallery and Odon Wagner Contemporary.